The Euphorbias are a wonderful group of plants – varied, yet unmistakable with their leafy stems and typically acid-yellow flower heads. A new discovery for me last year was this low growing form of Euphorbia rigida named ‘Chris Brickell’. 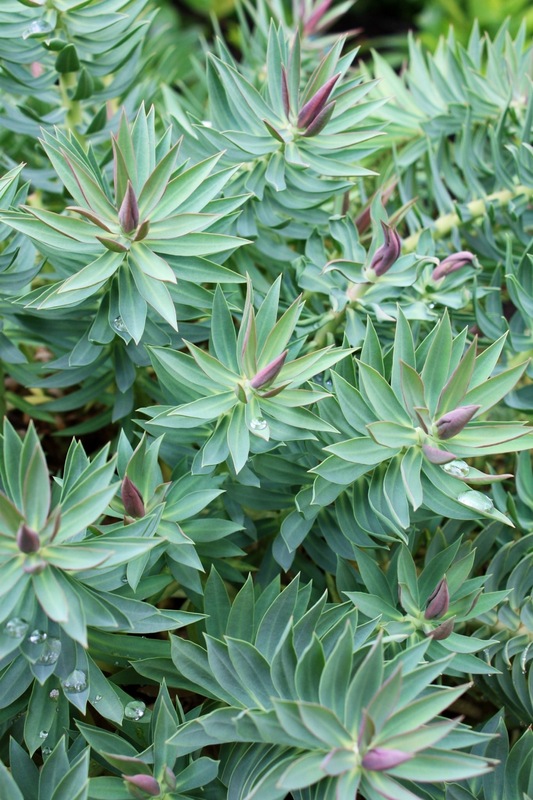 It’s similar to Euphorbia myrsinities but with pointed, glaucous blue leaves flushed maroon at the tips. Beautiful jewelled with raindrops or simply reflecting bright sunlight. This is beautiful; I like euphorbias. It also looks a little like a hebe, Pinguifolia, or ‘Red Edge’. Nice photograph! Thank you Candy – you’re right about it looking like a hebe!